SULPHUR, La. – After returning from the UK Monday night, the dust has settled on what was a huge learning experience in my early career. I must say the flight back was nice. I made sure to stay awake through it all to avoid jet lag, and it wasn’t a problem since the flight attendants offered me all the snacks I wanted! As soon as I landed and stepped outside, I immediately had to take off both of my Styled Aesthetic Team USA Scholarship jackets. I sure did miss that warm Louisiana weather! On a more serious note, I have a lot to look forward to in the near future, starting with the season finale in the Lucas Oil Formula Car Series this weekend at NOLA Motorsports Park in New Orleans. This was the circuit that I made my debut on the same exact weekend last year. It is where all of this really began for me. This, combined with the fact that I’ll have lots of family and friends there makes me feel like it will be a very special weekend for me. Beyond this, I have another very important event to mentally prepare for. 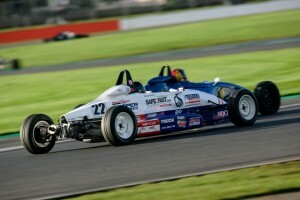 Both Jonathan and I have been given tickets to the Mazda Road to Indy USF2000 $200,000 Scholarship Shootout. 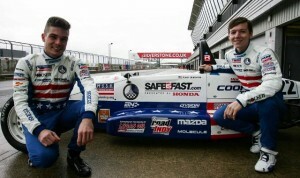 I can’t put into words how important this Scholarship could be to a young driver’s career. 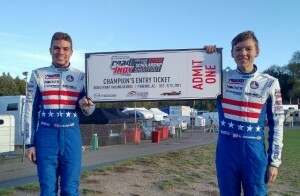 It would be a dream come true to continue following the footsteps of Oliver Askew, who won both a Team USA Scholarship and the MRTI Scholarship in 2016, then went on to claim this year’s Cooper Tires USF2000 Championship Powered by Mazda and another Mazda Scholarship which will enable him to graduate onto the next step of the Mazda Road to Indy – the Pro Mazda Championship – in 2018. Wow! After going on this journey in the UK, I believe I am a completely different driver. I have learned so much about the sport and I can’t wait to apply it to these future events. At the same time I know there is so much more to learn and I’ll keep grinding to find it! This last month has been such an adventure. With Jonathan and me going to London, getting to test and race at some of my favorite circuits in the world, touring F1 facilities, and meeting lots of cool people, I may miss it just a little! I’ll never forget it all as long as I live and it’s been nice telling stories to everyone that has asked me since I’ve returned. I give a very big thanks to Cliff and Michelle Dempsey for taking care of us and for the entire team for giving their best effort the entire time; I know my car was capable of great results! On top of everything I hope I’ve represented Team USA well. The amount of partners supporting Jeremy’s vision and the drivers year by year is something special, and I’m sure it will continue with the same strength and integrity. Thank you to all of my family, friends, and new friends for supporting me as well. I say it often but it means lots to me. Up next I have the final rounds of the Lucas Oil Formula Car Race Series this weekend and I can’t wait to see how the things I’ve learned in England translate! I’ll keep everyone up to date.